When you have a stroke, time is crucial. If you have any stroke symptoms, call 119 to be transported to the hospital right away. Do not delay! Do not try to drive yourself to the hospital. The earlier treatment is started after symptoms begin, the more likely you are to survive and recover. Your doctor can be alerted as you are traveling to the hospital. Any relatives or friends who were with you when your symptoms started should go with you to the hospital. 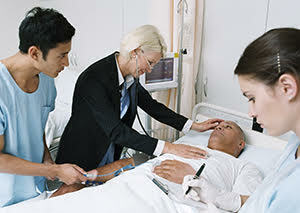 In the hospital, a doctor will assess your symptoms and when they occurred. You will also be asked about your medical history. You’ll also be asked about your health and risk factors. If they are with you, family or friends can answer if you cannot. You will likely have blood tests. You may also have a CT scan or an MRI. This will help determine what kind of stroke you have. The two types are blockage (ischemic stroke) or bleeding (hemorrhagic stroke). The type is important to know before treatment is started. This is because treatment that helps an ischemic stroke can kill a person who had a hemorrhagic stroke. The goal of the acute phase treatment is to minimize damage from the stroke. After the first several hours, treatment turns to your recovery and on preventing future strokes. F.A.S.T. is an easy way to remember the signs of a stroke. When you see these signs, you will know that you need to call 119 fast. · F is for face drooping - One side of the face is drooping or numb. When the person smiles, the smile is uneven. · A is for arm weakness - One arm is weak or numb. When the person lifts both arms at the same time one arm may drift downward. · S is for speech difficulty - You may notice slurred speech or difficulty speaking. The person can't repeat a simple sentence correctly when asked. · T is for time to call 119 - If someone shows any of these symptoms, even if they go away, call 119 immediately. Make note of the time the symptoms first appeared. · Keep a list of important telephone numbers next to your phone. Include your doctor and relatives or friends you want to be contacted. · Carry a list of all medicines you take, and the dosage of each, in your wallet. Include over-the-counter drugs, vitamins, and supplements. · Write a brief medical history, including any other medical problems you have had and the dates. Keep this with the medication list. Health Information Disclaimer: This site and its services do not constitute the practice of medical advice, diagnosis or treatment. Information is provided as a courtesy for educational awareness. Always talk to your healthcare provider for diagnosis and treatment, including your specific medical needs. If you have, or suspect that you have a medical problem or condition, please contact a qualified health care professional immediately. DO NOT change or discontinue your medical regimen based on any information you read here before discussing it with your medical provider. If you are in Jamaica and are experiencing a medical emergency, call 119. Access to 119 service may be very limited or non-existent in some rural areas, so PLEASE go to the nearest hospital immediately! Could There Be a Cure For Stroke? Sign up for fr*ee newsletter updates today! "Saving Lives Through Stroke Prevention and Awareness Education." 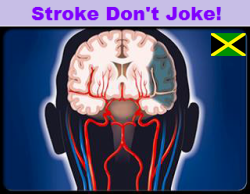 stroke prevention education, awareness, and support for stroke survivors, their families and caregivers in the parish of Westmoreland, Jamaica. nursing, please make sure to consult your personal medical provider before using any supplements mentioned on this website.